The simplicity and flavor of this four ingredient chicken enchilada amazes me. It really is easy and delicious. I LOVE this recipe! You can accent it with sour cream once it’s cooled out of the oven, or green onions, or whatever you like. Use as much or as little cheese as you want, but definitely use the entire 28 oz. can of enchilada sauce, it needs it or it will dry out! A+! A package of corn tortillas (6-inch) *I always buy 2 pkg’s at a time just because. In a large skillet with lid, bring 1″ water to a boil. Add chicken and season with salt. Cover and reduce heat to medium-low. Simmer 5 minutes, remove skillet from heat. Let chicken steam, covered, until cooked through or registers safe on an instant-read thermometer, about 12-14 minutes. When slightly cooled, shred with two forks and transfer chicken to large bowl. Mix 1 cup enchilada sauce with chicken; toss to combine. 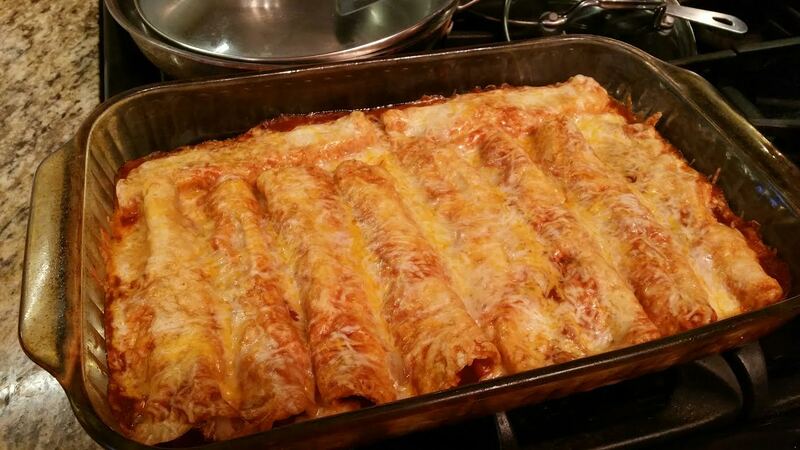 Spread some enchilada sauce evenly in a baking dish. (I used a 9×13″ Pyrex glass baking dish which has an awesome lid for later storage). Fill each corn tortilla with chicken mixture. Roll up tightly and arrange seam side DOWN, in a baking dish. Bake until cheese is melted and sauce is bubbling, 15-20 minutes. Let cool 5 minutes before serving (believe me! ).